“Now hear: I begin with nothingness. Nothingness is the same as the fullness. In infinity full is as good as empty. Nothingness is empty and full. You might just as well say anything else about nothingness, for instance, that it is white, or black, or that it does not exist, or that it exists. That which is endless and eternal has no qualities, since it has all qualities. “We call this nothingness or fullness the Pleroma. Therein both thinking and being cease, since the eternal and endless possess no qualities. No one is in it, for he would then be distinct from the Pleroma, and would possess qualities that would distinguish him as something distinct from the Pleroma. “In the Pleroma there is nothing and everything. It is fruitless to think about the Pleroma, for this would mean self-dissolution. “Creation is not in the Pleroma, but in itself The Pleroma is the beginning and end of creation. It pervades creation, just as the sunlight pervades the air. Although the Pleroma is altogether pervasive, creation has no share in it, just as a wholly transparent body becomes neither light nor dark through the light pervading it. “We are, however, the Pleroma itsel£ for we are a part of the eternal and the endless. But we have no share therein, as we are infinitely removed from the Pleroma; not spatially or temporally; but essentially, since we are distinguished from the Pleroma in our essence as creation, which is confined within time and space. “Yet because we are parts of the Pleroma, the Pleroma is also in us. Even in the smallest point the Pleroma is endless, eternal, and whole, since small and great are qualities that are contained in it. It is nothingness that is whole and continuous throughout. Only figuratively; therefore, do I speak of creation as part of the Pleroma. Because, actually; the Pleroma is nowhere divided, since it is nothingness. We are also the whole Pleroma, because, figuratively; the Pleroma is the smallest point in us, merely assumed, not existing, and the boundless firmament about us. But why then do we speak of the Pleroma at all, if it is everything and nothing! “I speak about it in order to begin somewhere, and also to free you from the delusion that somewhere without or within there is something fixed or in some way established from the outset. Every so-called fixed and certain thing is only relative. That alone is fixed and certain that is subject to change. “Creation, however, is subject to change; therefore it alone is fixed and determined because it has qualities: indeed, it is quality itself. “Thus we ask: how did the creation come into being! Creatures came into being, but not creation: since creation is the very quality of the Pleroma, as much as non-creation, eternal death. Creation is ever-present, and so is death. The Pleroma has everything, differentiation and non-differentiation. “Differentiation is creation. It is differentiated. Differentiation is its essence, and therefore it differentiates. Therefore man differentiates, since his essence is differentiation. Therefore he also differentiates the qualities of the Pleroma that do not exist. He differentiates them on account of his own essence. Therefore he must speak of those qualities of the Pleroma that do not exist. “You say: ‘what use is there in speaking about it at all! Did you yourself not say that it is not worth thinking about the Pleroma! “I mentioned that to free you from the delusion that we are able to think about the Pleroma. When we distinguish the qualities of the Pleroma, we are speaking from the ground of our own differentiated state and about our own differentiation, but have effectively said nothing about the Pleroma. Yet we need to speal( about our own differentiation, so that we may sufficiently differentiate ourselves. Our very nature is differentiation. If we are not true to this nature we do not differentiate ourselves enough. We must therefore make distinctions between qualities. “You ask: ‘what harm is there in not differentiating oneself! If we do not differentiate, we move beyond our essence, beyond creation, and we fall into non-differentiation, which is the other quality of the Pleroma. We fall into the Pleroma itself and cease to be created beings. We lapse into dissolution in nothingness. This is the death of the creature. Therefore we die to the same extent that we do not differentiate. Hence the creature’s essence strives toward differentiation and struggles against primeval, perilous sameness. This is called the principium individuationis. This principle is the essence of the creature. From this you can see why non-differentiation and nondistinction pose a great danger to the creature. the one and the many; etc. are one with the good and the beautiful. But if we remain true to our essence, which is differentiation, we differentiate ourselves from the good and the beautiful, and hence from the evil and ugly. And thus we do not fall under the spell of the Pleroma, namely into nothingness and dissolution. “You object: you said that difference and sameness are also qualities of the Pleroma. What is it like if we strive for distinctiveness? Are we, in so doing, not true to our own nature? And must we nonetheless fall into sameness when we strive for distinctiveness? “You must not forget that the Pleroma has no qualities. We create these through thinking. If, therefore, you strive for distinctiveness or sameness, or any qualities whatsoever, you pursue thoughts that flow to you out of the Pleroma: thoughts, namely; concerning the non-existing qualities of the Pleroma. Inasmuch as you run after these thoughts, you fall again into the Pleroma, and attain distinctiveness and sameness at the same time. The dead faded away grumbling and moaning and their cries died away in the distance. 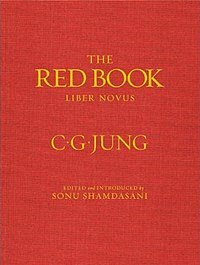 ~Carl Jung, The Red Book, Scrutinies, Pages 347-348. Previous Previous post: Carl Jung: There was a time when there were only four signs in the Zodiac. Next Next post: Carl Jung on the decline of traditional values in India and China.